On one side of the luscious scale is dense, creamy cheesecake. 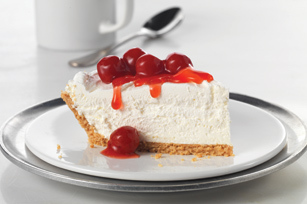 On the other is this—creamy, fluffy cheesecake made with COOL WHIP LITE Whipped Topping. Beat Neufchatel and sugar in large bowl with whisk or mixer until blended. Stir in COOL WHIP. Small ingredient substitutions, such as PHILADELPHIA Neufchatel Cheese, COOL WHIP LITE Whipped Topping and a ready-to-use reduced-fat graham cracker crumb crust result in a savings of 40 calories and 6 g of fat per serving when compared to a traditional recipe.